Himalaya Baby Diapers, with its unique, soft and easy-to-fit design, is specially formulated to provide the greatest comfort and care to your baby. 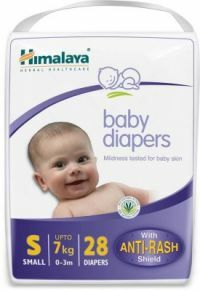 Himalaya Baby Diaper is enriched with a blend of natural ingredients, Aloe Vera and Yashada bhasma, which form a protective anti-rash shield that reduces the activity of harmful enzymes*, inhibits the growth of microbes, and prevents diaper rash. With the added benefit of a super absorbent polymer layer, the diaper absorbs multiple wettings and ensures maximum protection from dampness, so that your baby gets undisturbed and restful sleep. Our ultra soft diapers are clinically tested, hypoallergenic and free from fragrances. To Recieve updates and possible rewards for Himalaya Baby Medium Size Diapers please sign in. To Recieve updates and possible rewards for Diapers & Nappies please sign in.